Against a backdrop of serious leadership problems at the Police Scotland and the Scottish Police Authority (SPA) (both organizations are now leaderless) the Scottish Conservatives and Scottish Liberal Democrats have called for the integration of British Transport Police and Police Scotland to be put on hold. At the time of writing, full integration is scheduled for April 2019, just over eighteen months away. Going a step further, the Transport Salaried Staff’ Association (TSSA) has called for the merger to be scrapped, after a draft HMICS report on integration described the decision to merge the forces as ‘entirely political’, and without a detailed evidence base. The call for a pause is, I think, the right one. Stakeholder objections to the merger are now well-rehearsed and, in many ways, boil down to the policy-making process, notably a failure to fully assess the costs and benefits on both side of the border. The upshot of this omission is that integration does not appear to be proceeding smoothly. To take an overview of the recent timeline, in late 2015 the Scottish Government and Department for Transport established a Joint Programme Board (JPB), tasked with leading the integration project. 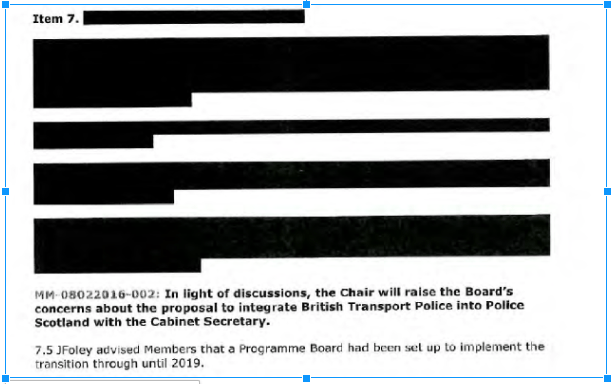 Consisting of senior figures from key stakeholder bodies (with the striking exception of Police Scotland and British Transport Police themselves), JPB agendas and minutes indicate that the group has met on a bimonthly basis from January 2016 onwards. In August 2016, several months ahead of the introductory Railway Policing (Scotland) Bill, SPA Board Members raised concerns about the merger at a private Board meeting. The substantive concerns are not clear (see redacted minutes below), although CEO John Foley stated that these would be shared with the Cabinet Secretary. SPA Board Members were also informed about the high-level Joint Programme Board (albeit it was by now in its eighth month of working). Showing signs of frustration at the limited headway made so far, in early 2017 senior JPB officials discussed the ‘critical need for Joint Leadership’ across the various work streams, and noted that ‘substantial progress’ was required to meet secondary legislation deadlines. We are extremely confident that we will deliver the merger successfully. My view and that of the Scottish Police Authority is that we successfully delivered the merger of the eight forces. However, a less optimistic outlook quickly resurfaced at the Authority. Noting that ‘the due date for going live was not that far ahead and yet due diligence had not yet commenced’, minutes from the May Board meeting set out a raft of concerns. With only twenty-two months until full integration, these included: pension arrangements and finance; the impact of costs on train operators in England and Wales; and whether Police Scotland systems could be integrated with BTP systems in the set timeframe. Expressing concern over the complexity and resourcing of the project, one Member queried whether the delivery period was feasible. Members also asked where the ‘additional significant resource’ would come from, ‘in view of the commitment made by the SPA, Police Scotland and Scottish Government to minimise the operating deficit.’ In response to the latter point, the CEO stated that ‘a business case would be developed for submission to Scottish Government for Reform funding to support the integration project’, while on the question of due diligence, it was noted that professional support would be procured. That neither due diligence, nor a business case to support the integration project was in progress by May 2017 should ring alarm bells. To put this in context, recall that the BTP Joint Programme Board on Integration first met in January 2016. Looking further back, the Scottish Government presented its Case for Support to the UK Government in December 2013, while Government intentions to integrate the forces date back to at least 2011. A month later, the SPA People Committee ‘confirmed that there is insufficient resource available with regard to demands of the project’, and that a paper had been submitted to ‘raise issues with regard to project management and legal resources’. Consistent with calls for the merger to be put on hold, Members again cautioned that ‘the timetable currently being worked may not be realistic’, and that the estimated costs of integration were still unknown. Taking an overview of the progress to date, as well as the sizeable challenges ahead, the call for the merger to be put on hold seems both reasonable and sensible. It would provide both Police Scotland and the SPA with some breathing space, in what are exceptionally difficult circumstances. A break would also allow the Scottish Government to address the gaps in its evidence base: to clarify the operational and business case, weigh up the risks, and work out the costs. The decision to integrate BTP in Scotland may be political; however, the merger is a matter of public safety and public money, and the Government has a duty to demonstrate that it is not taking undue risks with either. Nobody with the exception of the Scottish National party is for this proposal . They are doing it purely for political reasons . They do not care about the safety security and service levels that are currently delivered . They will not listen to anybody .